Growing The Team To Better Serve You! From the beginning of discussions with Greg, Paul & Sean, our vision for Topline Financial Advisors has been to provide an exceptional level of advice and service. As partners of the organization, we pride ourselves on the level of advice we provide to our clients. From a client service perspective, our support staff Debbie Ruskin and Kristine Dembinski take that same level of pride, combining their many years of experience to provide you with the highest level of client service. With the continued vision of building a team to better serve you, we are excited to announce the addition of Andrew Scott to our team. 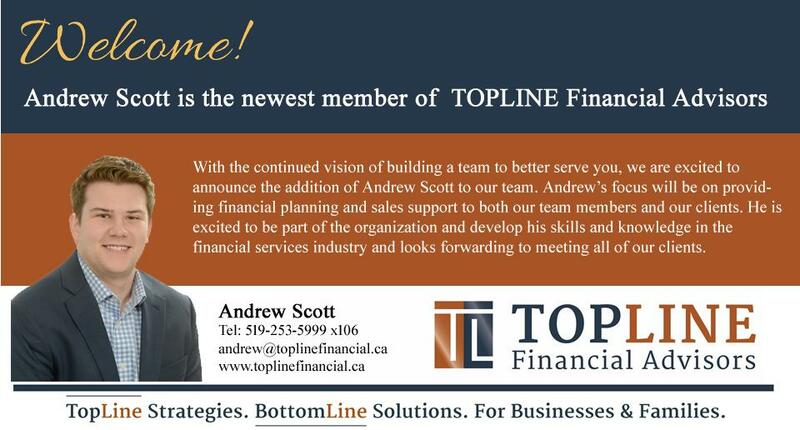 Andrew’s focus will be on providing financial planning and sales support to both our team members and our clients. He is excited to be part of the organization and develop his skills and knowledge in the financial services industry and looks forwarding to meeting all of our clients. Topline Financial Advisors is committed to the growth and evolution of our organization with the goal of providing you with the highest level of advice and service. Thank you to all of our clients for the opportunity to be of service to your family and your business.